Growing up I vividly remember being taken to restaurants with my parents & having to entertain myself with anything at the table. A little coloring book that the restaurant gave my mom, playing with a Barbie that I brought from home or my parents making games for me out of items found at the table. There were no IPADS let alone cellphones that had a variety of games or movie apps. As a child, I sat at a table sometimes just listening to my parents conversation or observing my surroundings. I never understood HOW difficult it is to capture a child’s attention for an extended period of time. In my opinion, it’s literally an Olympic sport. So let me start by offering major KUDOS to our parents and all parents out there for finding creative ways to keep their little ones happy & amsued especially when you are dining out. Thank you for inspiring this blog post. Listen I am NOT perfect & yes I do give my daughter a cell phone when we go out from time to time to play an educational game or watch Moana on Netflix. It’s not a mortal sin by any means. So don’t MOM Shame people! You gotta do what works for you and your family, so do what your gut tells you is best for you and your kids. For me personally, I beat myself up about giving into electronics all the time. I strive desperately to keep Penelope entertained by any means necessary before I resort to giving in to the phone especially when dining out. My husband and I love to dine out when we can find time and don’t want to hide in our house since Penny may get fussy at a restaurant. So I’ve made it a point to expose her and test a variety of activities to keep her from having a meltdown at the table. I can also say that this post is really a work a progress as there are times these activities just don’t work with Little Miss P and she wants nothing to do with being strapped into a high chair. But we do are best and we move onward. My hope is, I'm not alone in this struggle & the below activities/tips that I found to work for me on occasions will help any parents out there looking for new ways to keep their kiddos happy & entertained while dining out with them. 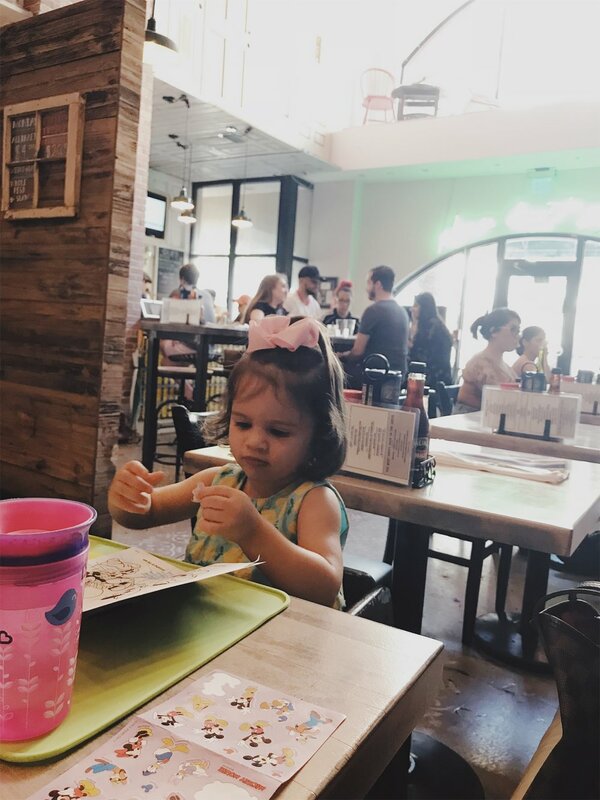 Even if you aren’t parents, but are dining out with a little one, these are some great ideas to surprise those special little ones in your life if you have an upcoming brunch date. Much more dorable than regular paperback books and easy to clean if your little one happens to spill something on it. I love to bring several books with me whenever I’m out with P that either are a fun story I can read to her or the book has an activity in it (eg. Finger puppet, hide and seek features, touch and feel). Books with sound are always a big hit too since kids love to play with buttons. I’m linking below some of my favorite books which I like to take with us whenever we dine out currently. I recently discovered these at The Cracker Barrell store and literally it’s my obsession. Whenever we do to dinner, I just grab one go this $1 kits, drop it in my bag and I’m ready for dinner anywhere that may not offer a fun kid’s activity menu. I love how the majority of them come with a full blown mini coloring book, stickers and a set of little crayons. Plus I’ve seen a variety of themes for boys and girls not only at the Cracker Barrell but at the Dollar Tree and Party City. If you cannot find these, head to the Dollar Tree to grab a color books/educational workbook, some crayons and pack of stickers to make your own activity kits that you can place in a gallon zip lock bag & toss in your diaper bag/purse. As a believer in teaching toddlers multiple languages, my heart burst when I found these awesome flash cards in both English & Spanish. I’ve always struggled with the Spanish language since my parents mostly spoke to me in English as a child; so I make it a point to expose Penny to the Spanish language as much as possible. I want her to have a stronger grasp on it so it encourages her in the future to expand her dialectics and potentially take on more. When I found these Bi-linigual cards with super cute illustrations by Mudpuppy, I knew I had to get them. She loves to shuffle through these, point out certain items and I like the flexibility of teaching her what bird means in both English & Spanish. MAJOR PLUS- They come in a ring so no need to worry about flash cards being thrown everywhere. Mommies that are reading this, I'm always looking to try new ideas & share them with other moms since it could be something that works better than the recommendations I have above. Looking forward to hearing your comments below and check out your suggestions!